April 25, 2012 by Aaron Kr. Many sneaker fanatics and aficionados never take into consideration the painstaking efforts that go into creating the shoes that they love. The design process can be a tedious one, especially when you consider all of the factors that can sometimes tie a designer’s hands. One of the largest stumbling blocks is the need to keep materials and costs manageable in order to ensure that the final product is affordable for consumers and profitable for the brand. While we’d all love to see our Nike’s loaded up with large Air Max bags, full-length Zoom units, carbon fiber, foam and all those other costly amenities, the bottom line is that these coveted luxuries can often drive pricepoints out of control, urging the need for more cost-effective material options in their place. But what would happen if Nike completely unchained the leash and opened the premium floodgates in the name of the ultimate performance basketball footwear? The answer is the Nike Basketball Elite Series, a no holds barred assault on the conventional design process and the budgeting limitations that can so often hold it back. 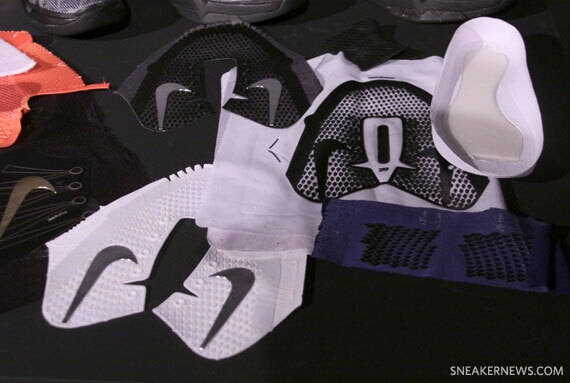 For Nike Basketball designers Jason Petrie and Leo Chang, the Elite Series project is like a dream come true. With pricepoint constraints thrown out the window, the gloves were finally off to go out and reach for the pinnacle of performance basketball footwear glory. That kind of freedom doesn’t come along very often for most footwear designers, and when it does, it’s accompanied by a responsibility to meet lofty expectations. For Jason, Leo and the rest of the Nike BBall team, the solution was to go back to the beginning to analyze and evaluate every aspect of each existing model to determine each and every place where performance could be enhanced. Materials were added, removed, invented, tweaked and shaved down, making the shoes lighter and stronger, as well as more responsive and comfortable, all in the name of providing NBA athletes and the consumers who buy the shoes with the ultimate option for the rigorous post season push. Right down to the types of threads that are woven into the laces and the sticky grips that contour to your step on the footbed, every possible detail has been considered and tailored to maximize the overall function of the shoe. The price tags might seem a bit high when you see these hit stores this weekend, but you get what you pay for and the Nike Basketball Elite Series has just raised the bar for what performance luxury can mean to a sneaker. Continue reading for part 1 of our interview with Jason Petrie and Leo Chang and check back tomorrow for the follow-up featuring everything you need to know about upcoming Elite Series colorways. Sneaker News: Since news of the Elite Series first leaked out, whenever the topic comes up, the discussion immediately goes right to the high price tag, so I think the logical starting point is to ask right off the bat – what makes the Elite series elite and what about these shoes justifies such a drastic jump in the pricepoints from what people are used to seeing for a premium basketball shoe? 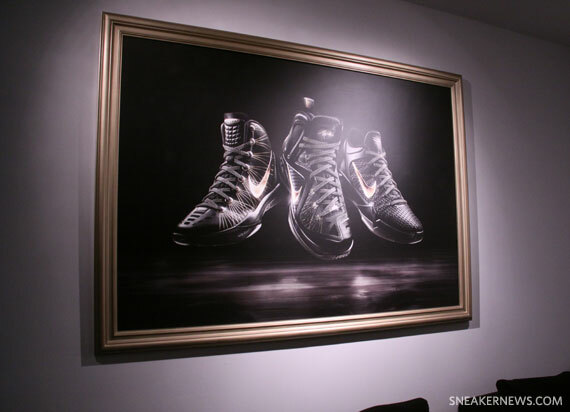 Leo Chang: With the Elite Series, our goal was to take arguably our best products that we currently do right now – the LeBron, the Hyperdunk and the Kobe – and make them even better. So it’s the best of the best for the most important time for NBA players right now, which is going for that run for the trophy. So for us, it was really taking the shackles off and allowing us to truly make innovative product that was purely around the performance problem solving that we deal with. There are a lot of brands that use premium leathers and all these luxury materials because of the status of those materials. For us, we’ve used the most premium materials for performance, like carbon fiber, like kevlar, Pro-Combat. Even down to the fine details like the sockliner, to even the laces to make sure everything is tuned for performance. Jason Petrie: That’s a really cool notion and I think that’s something we’ve picked up at Nike Basketball – that performance luxury. You get the luxury through that lens of performance, like a McLaren that’s all about getting around the Nürburgring faster than anybody ever could. It’s not about having a dope sound system in there. It’s not about having leather seats and all that kinda stuff. It’s about being performance first. And it’s still a million dollar luxury vehicle because of that performance. 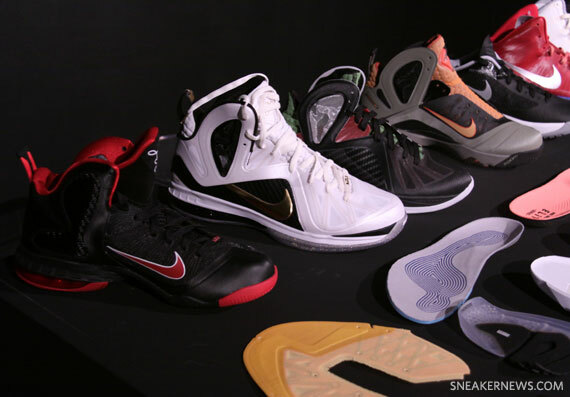 SN: Can you run us through the major changes from the original version of the LeBron 9 over to the Elite edition? 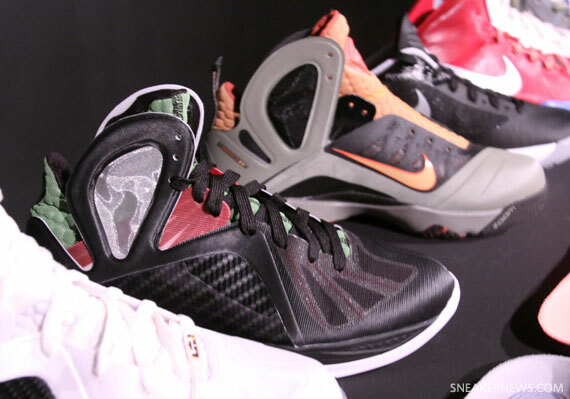 JP: With the LeBron 9, going for the full season, we did some new things like Pro-Combat and the dynamic wing on the side for support. LeBron’s all about having the support and a feeling of being secure in his shoes and protected. 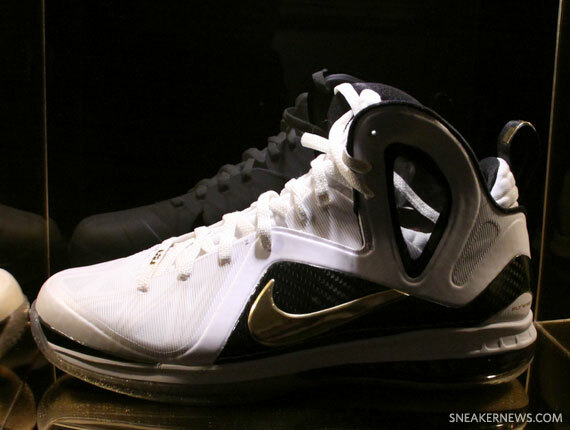 So with the LeBron 9, that was part of the triple threat of benefits we were trying to bring to him. And so with the Playoffs, we know that his mindset changes, so we wanted the shoe to change for that and really exemplify that “strength” notion without getting bulbous and heavy and thick. We really started with the bottom and worked our way up and totally changed the way the shoe was constructed. For the sole on the P.S., we actually took it and made it a little simpler just to take it back to basics and make it the best that we can. We re-engineered the midsole. We went in and changed the plate. 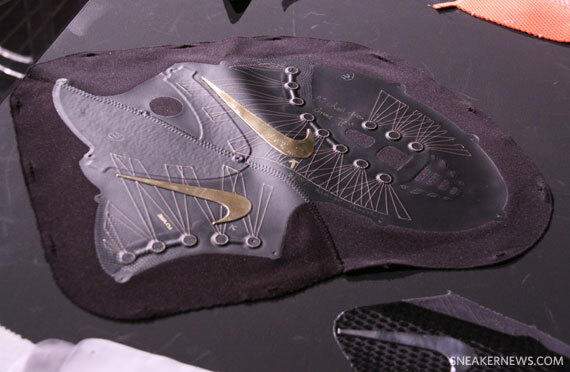 We started with a full carbon plate trying to mimic the orthodic that LeBron wears because he needs that extra stiffness in the shoe, but it turned out to be too much for the normal player to wear, because you really have to have super power to flex that and get the most out of it. So we ended up going with this set-up and thickened the Zoom bag up a little bit and changed the traction just to eliminate a little bit of rubber. And then moving into the upper, the biggest change you obviously see is the wing breaking up into this carbon lateral support element and deconstructing that ankle a little bit so that now it’s more like a low-top shoe with these extra harnesses around your ankle to give you that feeling of support, but they don’t add the collar of the LeBron 9 which is really protective and thick. So we kinda pulled some of that stuff out and still give the protection, but in a different way that actually allows for a little better ankle flexion, because the post-season is so much shorter so you don’t need that much protection up there. And then we expanded the notion of Pro-Combat through more of the shoe, so instead of just inside the wings on the LeBron 9, now it’s the entire bootie. And that’s something that LeBron really identifies with. He loves to feel those pads. Maybe it’s that football mentality. So we’re bringing that to the shoe as well, so when you strap it on, it’s like you’re putting on football pads. You feel like you’re ready to get hit and take that beating with no problem. And even furthering that, we updated the sockliner so that the impact protection is even better. We still use the 180 Max unit, but now we’ve got a dual density Elite sockliner that really cups your heel and this sticky print that helps the foot remain stable in the shoe and not move around so much where you don’t want it to move. These little details are just small tweaks here and there, but all together, you get a performance that’s drastically different and a feel that’s drastically different, as well as a different look. That’s the LeBron and with the others, I think we took each shoe and looked at the athlete we were making it for and what they would want for that time of year. For LeBron, it’s all about strength and these others guys are about a different set of qualities that they look for. SN: Obviously we know who the LeBron and Kobe models are tailored for, but what players do you take into account when developing the Hyperdunk? LC: We always look to Blake Griffin as “the Hyperdunk guy”, but really, it’s for postions one through five. You look at any team out there and it could be anyone from a point guard to a center wearing it, so we wanna make sure that it works for all of them. It’s the hardest project to do because it’s so versatile and has to be made for so many different players. 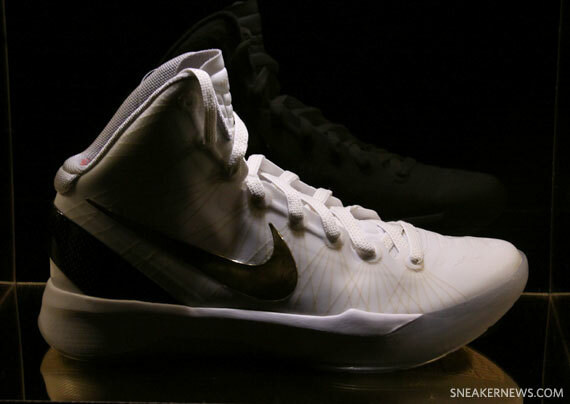 SN: With that in mind, what updates were made to the Hyperdunk 2011 design for the Elite version? 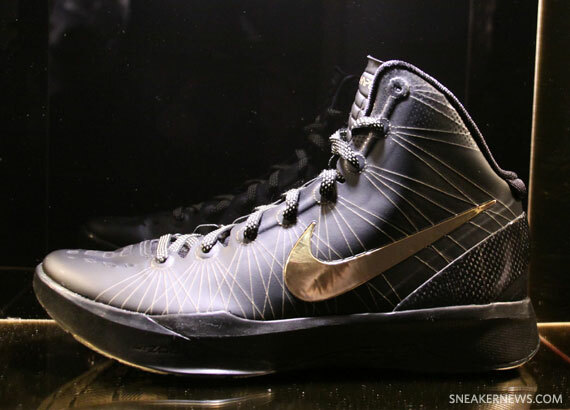 LC: Just looking at the Hyperdunk 2011, the way it was constructed, it’s actually pretty dynamic and pretty soft on the foot, so it fit really well. One of the things I was looking at was we used kevlar. Kevlar has less stretch than other conventional threads. It typically has 1-2% stretch, versus conventional nylon threads that have about 20-30% stretch, so you can imagine what that difference can do as far as the lockdown fit. So I thought, because this doesn’t stretch as much, can we reduce the number of layers in the (upper) package? 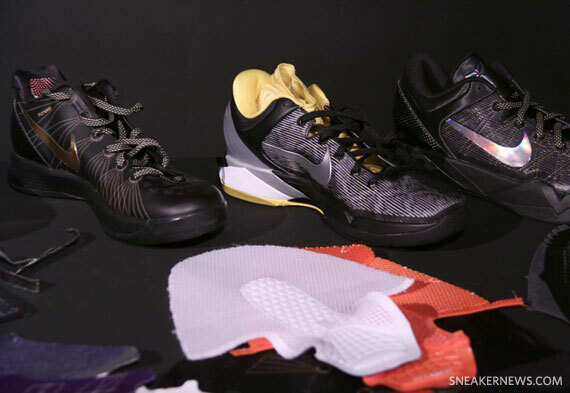 The original Hyperdunk 2011 has 4 layers, so what if we do two layers, and by reducing the layers, it actually got more dynamic and the material is a lot softer, so certain areas of the foot where you want more flexibility, you have less stuff digging into your foot and becoming an irritant. At this time of year, these guys don’t wanna have to think about hot spots and things that hurt their feet, so it just eliminates all those distractions. We did something cool too where we added the kevlar, but then we didn’t need the bottom thread on the backside, so we trimmed all that away and that just helps to shed weight and make it thinner. Some changes like that are subtle. I mean, it still looks like the Hyperdunk, but you’ll notice that all the overlays are gone. It’s one sheet of material and then we articulated the eyestays so that it breaks up and really moves with the foot. And some little details like we added a little sticky, grippy print on the achilles notch so that it reduces that internal heel lift movement. You want the best reaction time when you’re performing at the highest levels, so you can’t be slipping around and losing seconds falling over on a cut. So those are the sorta things we looked at. And of course, as you can see, one of the biggest changes is the carbon fiber heel counter. You can feel the spring and the responsive nature of it and it’s way different, so we used carbon fiber on the counter and the quarter panel and the shanks. It’s just about using the best materials possible. SN: Everyone loves the look of carbon fiber and we see plenty of faux carbon print used on sneakers, but you guys really went all out here by incorporating such large areas of the real deal material. Besides being cool to look at, what are the major performance benefits of the carbon fiber reinforcements? It’s something where the depth and the beauty of it really speaks to performance and there’s nothing fake about it. That beauty comes from the actual material and there’s something really honest and true about that and I think that’s why so many people are attracted to it. But it just works really well and it’s a process where we’d obviously love to use more, but using it just in special areas where it needs it, I think keeps it in the premium area and in that rarefied air type of zone. LC: Like on that LeBron, imagine you make a lateral cut and you hit that sidewall. If it was any other material like a plastic, it wouldn’t give back, so you wanna hit that wall and have it spring you back and not be sloppy and rolling over. It’s the same thing with the (carbon heel) counter as well. If you look at the difference in thickness of the counters from the regular 2011 to the Elite, you can imagine what kind of difference it can make to shed that much and be stronger as a result. 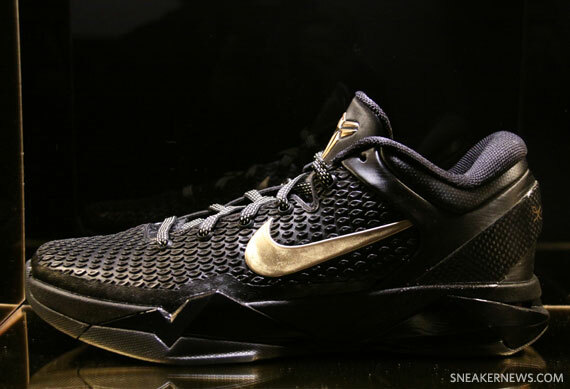 SN: The Kobe VII took on some changes as part of the Elite Series as well. What upgrades were made there? LC: Well, with Kobe, everyone knows “the system” (makes KobeSystem hand signal), so it was pretty cool to go in and change out the ride. That’s something that Kobe’s been wanting, so we said, okay, how do we make the ride better? So we started by going with full-length Zoom, because I think a lot of consumers have been asking for that, but it’s just a really expensive bag. So with the Elite series, if there was ever a time to do it, let’s do it now. So it’s the incredible heel to toe transition of the Zoom, the responsiveness and a lot of low to the ground cushioning. That was one upgrade and then looking at Kobe and the way he’s been wearing the system, he’s primarily been wearing the low. So for the Playoffs, we wanted to keep him in the low, because it works for him. And then, we went to a similar carbon counter (to the Hyperdunk) to really get that nice lockdown fit in the back there. These were kinda finicky things and we went round after round just to get the right shape and fit. Then we started looking how to visually take things a bit further, so we had this Predator pattern on the Kobe VII based on the three predators that he called out – the great white, mamba and leopard – and that became the pattern you see (on the original VII), so for the Playoffs, we figured, let’s bring back the “Mamba” and make that the predator for the Elite. 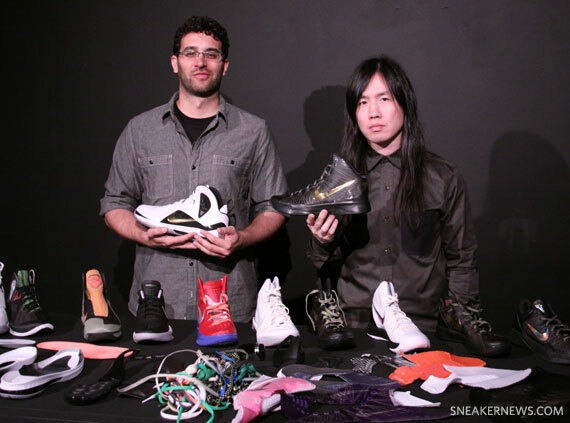 But how do we do that different from the Kobe VI and how do we make it even more functional? So you can see that the (snake scale) pattern is a little more zonal so it gets really dense in areas of the forefoot where you need that lockdown, and then in the areas where you want more flexibility, the scales get spaced out a little more. SN: So even the snake scales are placed with a function in mind? LC: Yup. They’re a little lighter, more dynamic, so we pushed it and what’s ridiculous is that we created new tooling just for that, which we thought was kinda outrageous, but we did it anyway. What’s really cool too is that if you feel it against the grain from the back, it actually has a little bite to it and when you look at actual snakeskin, it perks up a little so we wanted to create that dimensional feel to it and just how cold-blooded Kobe is and we wanted it to have that bite to it too. SN: I know you guys work closely and bounce ideas around in the office, but for the most part, it’s Jason working on the LeBron stuff and Leo working on the KD’s and Hyperdunks. Does a project like this allow you guys to work in more of a collaborative way and have a chance to put your touch on other models that you wouldn’t usually have input on? JP: I think in general, we’re a pretty collaborative group. We’re always in a room bouncing ideas off each other and we sit very close and work very closely, so we do that in general anyway. I think with this though, we’re able to come together on a common theme and for the first time really get to share some elements and coordinate. I know Leo worked for a long time on the finish of the Swoosh and what that was gonna be. So we start out together and then each just dive deep into each one of the projects and bring them back together in the end as one collective unit. But that’s very similar to how we work in general anyway. Normally, you have collections tied together by colors or a seasonal story, but now we’re able to do that a little tighter. 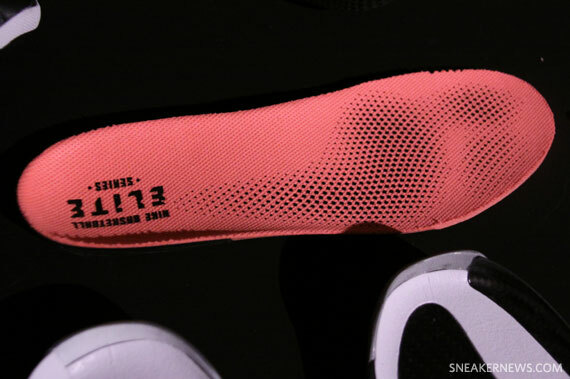 SN: Usually when Nike introduces a new technology or a concept like the Elite Series, the advancements and innovations make their way into future products and designs. Is this ultra-premium upgrade a trend that we’ll continue to see moving forward with rising price tags to go along with the higher grade materials and technology? LC: I don’t think we’ll be doing everything $200 and up, but I think we’ll take the learnings from everything we did on each shoe and they’ll trickle down to the future line and just regular shoes too. JP: Leo says it best when he talks about it being our “concept car”, where when you see that from a car company, it leads innovation for years to come. In this case, we brought the concept car to life, but it will continue to fuel things for us for years to come and we’ll continue to learn. That doesn’t mean we’ll make an all carbon fiber shoe, but it doesn’t mean we won’t if that’s where it leads us. SN: I’d like to see that! LC: You can see this pile of laces in front of you. Across the board, we just wanted to get after certain things to be able to share in the greatness of what we were trying to do. So right down to the laces, where conventional laces have some stretch and give, we were doing all this amazing stuff with carbon fiber and kevlar Flywire – all stuff that’s supposed to help you lock down and not have a ton of movement – so you couldn’t have conventional laces in there. Every little detail like that. We went through round after round of kevlar laces to get what we wanted, so there’s less stretch in there. JP: Laces are often a forgotten component, and you just put any laces in, but these are actually considered so that the performance benefits are upheld when you tie the shoe. LC: A lot of people see laces as cosmetic since it’s usually such a generic thing, but these laces with the kevlar in them are ten times the cost of normal laces. Stuff like that could mean the split second difference that means everything on the court. JP: It’s the combination of all these things. Maybe you won’t ever need it, but if you do, it’s there. Much thanks to Jason, Leo and the entire Nike Basketball crew. Stay tuned tomorrow for part 2 of our interview where you’ll get the full lowdown on Elite Series aesthetics and colorways.